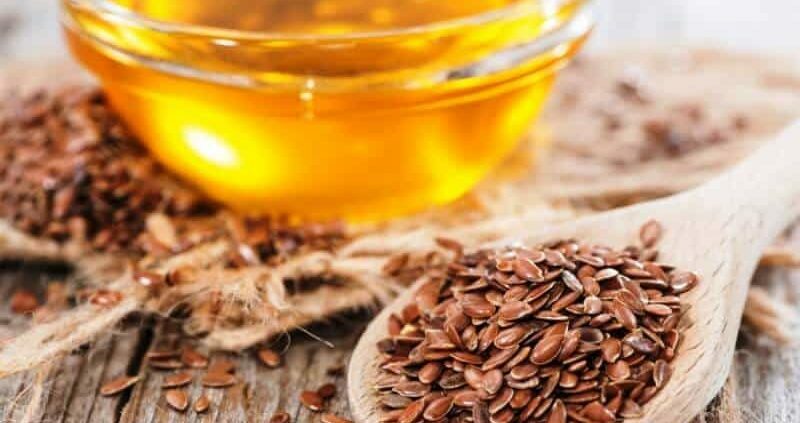 Flaxseed oil- if you are already familiar with it, you may relate to many of its uses.If you don’t know the slightest about it, you will thank me at the end of the article. Flaxseed oil, which is also commonly known as linseed oil, is often colourless or a pale yellow coloured fluid, from ripe flax seeds gone through the drying process. The Scientific name of the plant from which it can be obtained is Linum usitatissimum.‘What are some of its general applications?’, you may ask! Flaxseed oil is easily oxidized, and becomes rancid rapidly, with an unpleasant odor, unless it is refrigerated. Even if kept under cool conditions, it shows a shelf-life of only a few It is not recommended for cooking use, yet a study does show that alpha-linolenic acid (ALA)while bound in flaxseed, was found to be usable for the kitchen. When bound to flaxseed, the ALA can withstand temperatures up to 350F (176.67C) for 2 hours. Food-grade flaxseed oil is cold-pressed, obtained without any solvent extraction, in oxygen absence, and marketed as edible oil. Fresh, unprocessed and refrigerated, linseed oil can be used as a nutritional supplement and is also a traditional European ethnic food, regarded especially for its hearty taste. It contains one of the highest levels of the omega-3 fatty acid ALA among all vegetable oils.Regular linseed oil contains between 52% and 63% ALA (C18:3 n-3). But plant breeders have developed flaxseed with both higher ALA (70%) and lowest ALA content (< 3%). When I said Flaxseed OIL, the first thing that may have come into the mind would have been, ‘Is it edible?’Of course, it is! And following are some of its many uses as a food supplement. Flaxseed oil can be used for many different conditions, like rheumatoid arthritis and high cholesterol. It is also applicable for treating anxiety, osteoarthritis, benign prostatic hyperplasia (BPH), drying of eyes, vaginal infections, “hardening of arteries” (atherosclerosis), high blood pressure, heart diseases, diabetes and an attention disorder (ADHD). Many people also use it as a laxative for constipation, for losing weight, and to prevent breast and prostate cancer. It can also be applied to the skin for soothing irritations or soften its roughness.In foods, it can be used as cooking oil and mainly in margarine. Not only is it a food supplement for a few diseases, but it also helps in the treatment of some very common diseases. Some of the uses are given below are surely going to benefit you! There is some evidence that taking flaxseed oil may improve attention, restlessness, impulsiveness, and self-control in children with ADHD. There are some other essential oils for ADHD that help to treat this. Changing the amount of linolenic acid in the diet can help in preventing hardening of the arteries. Flaxseed oil has parts of linolenic acid, and thereby some people suggest that it might help to prevent atherosclerosis. Though this assumption looks quite reasonable, there has been no research yet to prove its correctness. Women who have higher levels of alpha-linolenic acid in their breast tissue are likely to get breast cancer very less. Scientists think that higher intakes of linoleic acid may protect against breast cancer. Flaxseed oil is the primary source of linolenic acid. However, it is not proven whether increasing flaxseed oil intake would help to prevent breast cancer or not. People with an existing heart disease consuming more alpha-linolenic acid in their food plan seem to have lowered the risk of dying from heart disease. It is one source of alpha-linolenic acid. However, researchers have not directly measured any effect of flaxseed oil intake on heart disease outcomes. It is also unknown if flaxseed oil supplements have the same effects as flaxseed oil intake from food. Almond Oil also prevents heart ailments and regulates blood pressure. Early research suggests that taking flaxseed oil reduces irritation and symptoms of dry eyes. A product containing fish oil plus flaxseed oil (TheraTears Nutrition) can also reduce symptoms of dry eye and increase tear production. Eye problems and dry eyes can be treated with the use of Black Currant Essential Oil. There is inconsistent evidence regarding effects of flaxseed oil for dry skin. Some researchers suggest that taking flaxseed oil by medium from the mouth with alpha-tocopherol daily for 12 weeks did not improve skin moisture in women with dry skin. However, others suggest that taking flaxseed oil in a similar for the same length of time can improve moisture and roughness of the skin. Low-quality research has suggested that α-linolenic acid, a chemical in flaxseed oil, will not improve muscle strength in older adults. Early research suggests taking a formula with contents arginine, RNA, yeast and alpha-linolenic acid, improves weight gain, but not immunity function in people with HIV. Studies suggest that flaxseed oil supplements help in lowering blood pressure in men with normal blood pressure and high cholesterol. It is not clear if it will lower blood pressure in people with high blood pressure or not. Research suggests that taking flaxseed oil for six weeks may help in lowering triglyceride levels, but would not affect weight, blood sugar, or cholesterol levels in the women diagnosed with PCOS.Consuming alpha-linolenic acid in diet seems to be linked to reducing a risk of developing pneumonia. However, research has not directly measured any effect of flaxseed oil intake on outcomes of pneumonia. It is also unknown if flaxseed oil supplements will have the same effects as flaxseed oil contained from food. You can also follow some other home remedies to treat PCOS. Research is inconsistent on effects of the flaxseed oil ingredient, α-linolenic acid, in prostate cancer. Some research suggests that high intake of alpha-linolenic acid is linked with an increase in the risk of prostate cancer. Others suggest high intake or high blood levels of alpha-linolenic acid is not linked overall with any risk of prostate cancer; however, extra amounts of alpha-linolenic acid might worsen existing prostate cancer. The source of alpha-linolenic acid is important. Alpha-linolenic acid from dairy and meat sources can be positively linked with prostate cancer; however the acid from plant sources, such as flaxseed or flaxseed oil, should not affect prostate cancer risk. Yes! Yes! It seems that flaxseed oil is a medical boon, it helps in almost every condition. But also note that there are a few restrictions. Researchers suggest that taking flaxseed oil on a daily basis for 16 weeks does not improve symptoms of mania or depression in children having bipolar disorder.Also, it does not lower blood sugar or improves insulin levels in people with diabetes of type 2. Early research suggests that taking flaxseed oil daily for a time of 3 months lowers total cholesterol in people with high cholesterol. This early research, however, can not be said reliable. More high-quality proof suggests that flaxseed oil does not help reduce cholesterol levels in people with previously high cholesterol and high triglycerides. Taking flaxseed oil daily for three months seems not to improve the effects of pain and stiffness, and has no effect on laboratory tests that measure the severity of RA. It looks like flaxseed oil is a must-include in a daily diet, due to its disease-helping information. But also, one thing to always take care is, you don’t exceed using it. It might be an ultimate food supplement, but it also has a few side- effects, which you probably don’t want to get into trouble with! Flaxseed oil is LIKELY SAFE for most adults when taken orally in appropriate amounts.However, large doses of 30 grams/day or higher can cause loose stools and diarrhea. Also, note that allergic reactions have been recorded to have occurred while taking flaxseed oil. Some men worry taking flaxseed oil because it might increase the chance of getting prostate cancer due to the α-linolenic acid that is contained in it. Researchers are still trying to find out the role of the alpha-linolenic acid in prostate cancer. Some researchers suggest that alpha-linolenic acid may increase the risk of getting or make existing prostate cancer worse, but other studies have found no such connection. Nevertheless, the α-linolenic acid in flaxseed oil does not seem to be any problem. Alpha-linolenic acid obtained from natural sources like plants, such as flaxseed, does not seem to affect the risk of prostate cancer, although alpha-linolenic acid obtained from dairy and meat sources has been linked in few studies with prostate cancer. Enough is not known about the safety of flaxseed oil when applied to the skin. So take care, before blindly trusting flaxseed oil for only its advantages. Please do go through following precautions, to be on the safe-side and using flaxseed oil wisely; because the wiser you are maximum you will benefit! Flaxseed oil is POSSIBLY UNSAFE when taken orally during pregnancy. Some researchers suggest that flaxseed oil may increase the chance of premature birth if taken during the second or third trimesters of the pregnancy. However, others suggest that taking flaxseed oil might be safe if starting from second or third trimester and continued until delivery. Until anymore is known, pregnant women should avoid taking flaxseed oil. Flaxseed is POSSIBLY SAFE for children when taken orally, for short-term. There isn’t reliable enough information available about the safety of flaxseed oil during breastfeeding. Avoiding using it while breastfeeding will be safe until more is known. Flaxseed oil may increase the risk of severe bleeding in patients having bleeding disorders. It is best to talk to your healthcare professional before using flaxseed oil if you have a bleeding disorder. Flaxseed oil may increase the risk of bleeding during and after any surgery. It is required to stop using it at least 2 weeks beforehand scheduled surgery. Given advantages and precautions, the question arising in curious minds will be, ‘How much will be too much?’ Or ‘How much should I take so that I end up only in advantage’. This will surely answer any such questions. The appropriate dose of flaxseed oil depends on various factors such as user’s age, health, and other conditions. Currently, there is not much scientific information to determine proper range of prescribed doses for flaxseed oil. It should be kept in mind that natural products are not necessarily safe and dosages are important. Always be sure to follow given directions on product labels and consult a pharmacist or physician or any other health professional before using. Note that the flaxseed oil will easily break down chemically if given exposure to light, heat, or air. It should be stored in a frosted bottle and guarded against heat. It can be ideally stored in the refrigerator. Having looked at the uses, it makes us wonder, ‘WHAT makes flaxseed oil a part of so many products?’. This is where it’s real information; the chemical composition comes handy. Doubly unsaturated linoleic acid(at 14.2-17%). Having high contents of desaturated and tri-unsaturated esters, it is particularly susceptible to polymerization reactions when exposed to oxygen in the air. This polymerization, also known as drying, results in rigidification of the material. This process can be so exothermic that it poses a fire hazard under certain conditions. To prevent it from drying prematurely, linseed oil-based products (oil paints, putty) are required to be stored in air-tight containments. Like other drying oils, linseed oil exhibits fluorescence under Ultraviolet light once degraded. Going through almost all uses and precautions, one might wonder, ‘What if I don’t use it at all?’. Well, let me tell you, my friend, ignorance is never good. So before plainly neglecting the idea of including or excluding flaxseed oil in your diet, it is best you know what you may miss while doing so! According to Center for Disease Control and Prevention, estimated one in three Americans (68 million) has a high blood pressure condition, which is commonly known as hypertension. The normal blood pressure reading is 120 over 80. (If your blood pressure consistently exceeds these numbers, it is recommended to talk to your doctor.) Fortunately, flaxseed oil is also able to help, as researched byGreek researchers. In a 12-week study of 59 middle-aged men, the Greek researchers discovered that flaxseed oil consumption results in significantly lowering blood pressure. Consider adding flaxseed oil to your regular diet and you may help in saving yourself, literally from headaches and other symptoms or causes associated with hypertension. Research has already proven how damaging regular tanning can be to your skin. But if you are a sun worshipper, it may be considered smart to consume flaxseed (on top of regular sunscreen). Omaha researchers found that mice that were fed flaxseed supplements were successful in reducing melanoma tumours by 63%. The truth of life: Depression hurts. Plenty of antidepressants are available that doctors prescribe; but according to toJapanese studies, simply adding flaxseed to your diet proved much useful. The study found that patients are having significant depression levels also suffered from low levels of docosahexaenoic and eicosapentaenoic acids – exact acids that are found in a variety of foods such as fish, walnuts, and flax. Eat up, as theory suggests, and it may help correct those imbalances. If you are living healthy and fit lifestyle, but still can’t shake your consumption of alcohol? Just like any other self-destructive behaviors, you might be putting yourself at a big risk. One very serious possibility can be liver disease. Fortunately, those who cannot seem to help themselves, there are ways to decrease risks involved with the live. Recent researchers of 30 men found that, who received flaxseed lignan capsules, could effectively reduce the liver disease risk factors. It all finally comes down to just one decision: to have or not to have flaxseed oil regularly? Natural flaxseed oil is packed with numerous health benefits that you can’t probably go wrong with. A daily intake of such healthy oil offers a lot of advantages and goodness. But it is still recommended to talk to a natural health specialist before making organic flaxseed oil a part of your daily routine. Caligiuri SP, Aukema HM, Ravandi A, Guzman R, Dibrov E, Pierce GN. Flaxseed consumption reduces blood pressure in patients with hypertension by altering circulating oxylipins via an a-linolenic acid-induced inhibition of soluble epoxide hydrolase.Hypertension. 2014;64(1):53-9. GISSI-Prevenzione Investigators. Dietary supplementation with n-3 polyunsaturated fatty acids and vitamin E after myocardial infarction: results of the GISSI-Prevenzione trial.Lancet. 1999;354:447-455. Kris-Etherton P, Eckel RH, Howard BV, St. Jeor S, Bazzare TL. AHA Science Advisory: Lyon Diet Heart Study. Benefits of a Mediterranean-style, National Cholesterol Education Program/American Heart Association Step I Dietary Pattern on Cardiovascular Disease.Circulation. 2001;103:1823. Leitzmann MF, Stampfer MJ, Michaud DS, Augustsson K, Colditz GC, Willett WC, Giovannucci EL. Dietary intake of n-3 and n-6 fatty acids and the risk of prostate cancer.Am J Clin Nutr. 2004;80(1):204-16. Prasad K. Dietary flaxseed in prevention of hypercholesterolemic atherosclerosis.Atherosclerosis. 1997;132(1):69-76.